The nose starts off with concentrated sherry notes, along with massive dark fruits - rum soaked raisins, dates and stewed plums. Liquorice with sweet Demerara sugar, cinnamon spice and a whiff of tobacco leaves in the back. The alcohol is barely noticeable. A gorgeous nose! Bold and intense on the palate. Now the alcohol comes through rigorous tickling the tongue. Then a rich and deep mix of sherry flavours arrives, lovely accompanied by rum soaked plums, raisins, caramel and dark chocolate. Spiced oak, cinnamon, a touch of nutmeg and white pepper linger towards the finish. The finish is long, sticky sweet and creamy. Raisins and stewed plums accompanied by walnuts, tobacco leaves, cinnamon and dark chocolate on the tail. Yummy! More lively with a splash of water. The big sherry notes and sweet fruitiness is a bit tamed while spiced oak becomes more prominent. Still sweet and fruity on the palate with sherry, plums and raisins, but also significantly drier with more oak spice and bitter orange peel. The alcohol bite is noticeable tamed. The finish is still long, lingering sweet and creamy with plum compote, dark chocolate, cinnamon, nutmeg and oak spice. This is what you expect from a hand-filled bottling of GlenDronach single malt. Dark, rich, and beautifully composed - a natural sherry character. 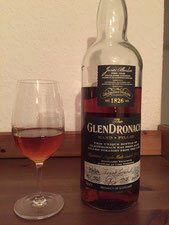 Although the alcohol bite is fairly noticeable on the tongue, this dram is impressive, lovely complex and well-balanced tolerating a drop of water, or two. Perfect match as after-dinner or late-night whisky.